My intention is to add 2.4 miles to the JFK 50-Mile (to make it a double marathon). Then, after 4 days of recovery, beginning on Thanksgiving Day, I will “run” the NCR Trail Marathon on 3 consecutive days - the third day being the actual event. In my previous Entry, I invited you to contribute between $10 and $30. All the money collected will divided equally between the three foundations listed above. I have set up a Pay Pal account exclusively for contributions: shane.eversfield@gmail.com. Contributions to date are $0.00. However, I am not discouraged by this. Regardless of the financial outcome, I am certain that my commitment to complete this endeavor will still benefit those (like my step brother) who are experiencing one of these diseases. In the previous Entry, I summarized my training for this endeavor from Sunday, 20 October (7 days after USAT Long Course Triathlon National Championship) through Saturday, 26 October. Obviously, the focus is on running. I ran a total of 13 hours that week - a radical increase in running volume for me. On Sunday, 27 October, I started to integrate my training with a tooth ache. This is nothing new for me. Evidently, my teeth are my “achilles heel” - the weak link in my life line. I’ve learned to live with this - often I am able to win the battle with infection and forego any dental procedure. I began the day with a 45-minute run - including 8 short, intense hill repeats - before teaching Day 2 of a Total Immersion Weekend Workshop at the TI Swim Studio (in New Paltz). Midday, between pool sessions, I ran again and added in short bouts of jump rope drills. In the evening, I biked easy for 30 minutes. Betsy and I stayed in New Paltz - electing to return home on Monday afternoon. 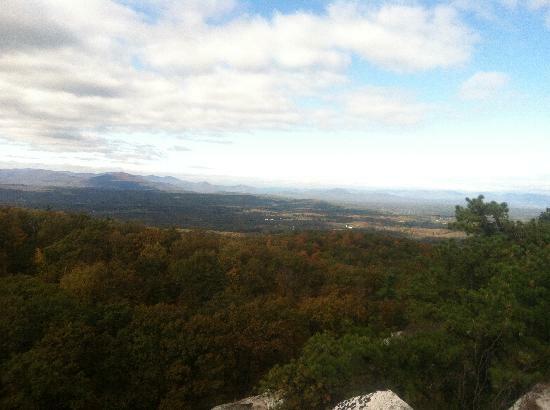 On Monday, I arose early and headed for the Mohonk Preserve Spring Farm Trail Head for a trail run. I ran 3 loops of the American Zofingen run course - 5+ miles per loop, with 5-600 feet of elevation per loop. I was able to re-fuel between each loop - carrying just a single hand-held bottle as I ran. I ran in my New Balance Trail Minimus shoes instead of the Vibram 5-Fingers. (I’ve broken two toes in the past running this trail in the 5-Fingers.) Total time for this spirited run: 3:10. In the afternoon, Betsy and I enjoyed a beautiful autumn drive through the Catskills as we returned home. Early Tuesday, I biked up to the Cornell Track with plenty of water, Hammer Perpetuem and the New Balance Road Minimus shoes. After a brief warm-up to loosen my legs, I ran 4X4-miles. For each 4-mile interval, I maintained a 9:55 mile-pace for the first 3 miles, then a 9:20 pace for the final mile. After each 4-miles, I paused to re-fuel my water bottle. To finish, I ran 2 more miles at 8:30 pace. Total mileage was just under 20 miles, total time 3:10. There was a design to this “one-two punch” of back-to-back long runs. The hilly, technical trail run on Monday built strength and durability. The flat (and some might say “monotonous”) track run on Tuesday focused on ultra pacing and consistent technique on an unchanging surface and topography. Specifically, this track run will prove valuable training for the JFK 50-mile (with 28 miles along the C&O Canal) and the three repeats of the NCR Trail Marathon (mostly on the North Central Rail Trail). By Tuesday, I was experiencing some intense flare-ups from my tooth. I took ibuprofen before bed on Monday night and before a midday meal and bedtime on Tuesday. Wednesday, I did my usual early-morning Pilates-yoga “body tune-up” before working at the Green Star Food Co-op Bakery. Midday, I rode 50 minutes easy - just to deliver our rent check to the rental property management. In the evening, I “zen swam” 20 minutes before leading Swim Mastery. Throughout the day, I experienced some intense bouts of pain. I was resigned to call the dentist. ...First thing Thursday morning. I had a low fever Wednesday night - including those strange fever-induced dreams. Getting through my T’ai Chi practice Thursday morning was a bit of a challenge given the stiffness I felt in my joints from the fever and the haze in my mind. However, if I consider what those who are dealing with ALS, MS or MD experience on a daily basis - with very little or no hope of reprieve - my condition was trivial. I ran 30 minutes before walking to the dentist office. The diagnosis after a few x-rays: Abcess around the root of a molar that already has a crown. I made an appointment for “exploratory work” that will lead to the decision of root canal versus extraction. This gives me 6 days to see if my body can beat the infection - without antibiotics - and escape the need (and expense) for dental work. The tooth gives me little or no pain when I run. Now there’s motivation!! When I returned home, I headed back out for another 45-minute session - including some drills and hill repeats. Thursday was Halloween, but I felt no urge to eat candy. Friday dawned with a light drizzle, a forecast for clearing skies, and gusting winds. High temperature expected to be mid-40’s. Without as much fever, T’ai Chi (and coaxing my body into mobility) was much easier than Thursday. I packed up some nutrition and rode my bike to the Cornell Arboretum. The weather began to clear. Ideally, I wanted to run 5-6 hours. However, I knew my body was not up for that - given the challenge of fighting the infection from my tooth, and the accumulated fatigue from the abrupt ramp-up in my run volume. (Through the triathlon season, I ran 3 - 5.5 hours a week. After a week of recovery from USAT Long Course Triathlon National Championship, I jumped to 13 hours in the first week. Now I was attempting to sustain (or even surpass) that, and cope with that accumulated fatigue. I can adjust the duration of the run to respond to my body’s ability to benefit from the stress. I can carry just one water bottle for 60-75 minute loops. I can choose my fuel and the concentration each time. I can add or subtract clothing. This was the toughest run so far in my concentrated run training - perhaps in the entire season. I felt sore and achy throughout - due to the infection and training fatigue. (I do not ingest any ibuprofen before or during my training. I don’t want to mask any discomfort that might be heralding the onset of injury.) And other than a pot of strong ginger/weak green tea before I set out, I did not ingest any caffeine. I could have “pushed through” to 5 or 6 hours (to satisfy some mentally constructed “quota”) with the aid of these two drugs, but that would be flirting with disaster. I ran 4:10 total, in Vibram 5-Fingers, on mostly grassy terrain of varying pitch and camber, with lots of hill repeats of varying length. The gusting winds, beautiful vistas and autumn colors, and my constant silent mantra recitation for those with ALS, MS and MD kept me going through the feelings of malaise. As with every stride of every run - but especially this one, with an increased risk of injury - I focused intently on my alliance with gravity. Every step required correct spine-hip-knee-ankle-foot alignment. The constant variation of surface pitch and camber and minimal footwear stimulated and supported that focus. I feel that I orchestrated the maximum amount of running stress my body could absorb - thanks to my non-judgmental inner listening. I returned home with virtually no tooth pain at all for the rest of the day. Amazing. I ingested a total of 400 mg. of ibuprofen the entire day/night. I felt like I might just be winning the fight here. Saturday, I rose early for a Pilates-yoga tune-up before heading to the pool to work with a client. As we finished our session, I could feel the tooth beginning to complain. Regardless, I swam for 20 minutes, then steamed for 20 minutes before heading home. No running today. I ended up ingesting a total of 800 mg. of ibuprofen that day/night. When I tallied my training time for the week, my run volume (time) was exactly the same as last week: 13 hours. That will do just fine!! My observation: Less aerobic exercise/mobility reduces the ability for my metabolism to deal with the inflammation and discomfort of the infection. However, my body does requires recovery and adaptation. I still have weeks of elevated run volume to embrace.